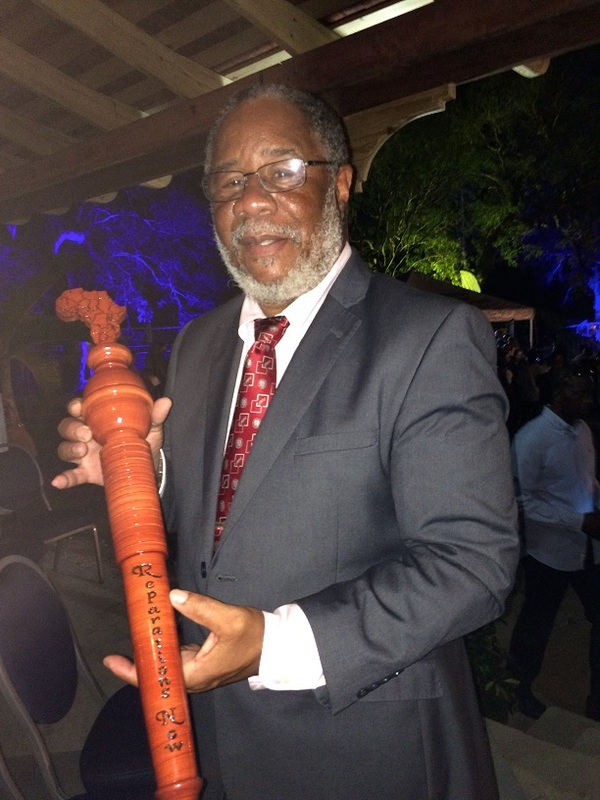 Prof. Pedro Welch, chairman of the Barbados Reparations Task Force, with the Reparations Relay Baton. The CARICOM Reparations Commission (CRC) has launched an International Reparations Relay & Rally Initiative in Barbados that in coming months will take a ‘reparations baton’ and ‘reparations torch’ from one CARICOM country to the other. The baton and torch will be presented to the national reparations commissions across the region at youth rallies organized under the banner ‘Roots, Rock, Reggae, Reparations’ which will celebrate the principles and programmes of the Caribbean and global reparatory justice movements. The Barbados launch of the reparations relay coincided with the bi-centennial commemoration of the death of General Bussa, the inspirational leader of the Barbados slave rebellion of 1816. At a cultural/historical ceremony entitled “From Bussa to Barrow,” on Saturday, April 16th at the site where Bussa was killed, Prof. Pedro Welch, chair of the Barbados Reparations Task Force passed the ‘reparations baton’ to the Deputy Consul General of Guyana in Barbados who, in turn, will soon pass it to the Guyana Reparations Commission, which is planning to hold their reparations youth rally in May. From Guyana, the baton will be taken to other CARICOM countries during the course of 2016. Beautifully carved from fine Barbados mahogany wood, the baton is a symbol of justice that has engraved on it, a map of Africa, the words “Reparations Now,” and rings representing the 15 CARICOM countries. The relay will culminate in Jamaica later this year where the Emancipation Rebellion led by Sam Sharpe will be remembered and celebrated. Prof. Welch added that the passing of the Reparations Baton from Barbados to Guyana represented an historic moment that “symbolized the maturing of the reparations initiative in the CARICOM countries.” He said that it linked the struggle in Barbados with a wider Caribbean and global movement. “From the very inception of the Task Force on Reparations in Barbados, it was felt that while there was a Barbadian component to the initiative, there was a wider sphere of operations that would require a Caribbean-wide collaboration. It is in its fraternal association with the regional body that the celebration of the 200th anniversary of the Bussa rebellion of 1816 provided an opportunity to initiate the symbolic passing of a reparations baton, sequentially, to other CARICOM countries. “Quite apart from the regional focus, the local events in Barbados also provided an opportunity to see how the issue of commemorating a special moment in the historical narrative, namely a slave rebellion, ties this local event into the larger global struggle,” added Dr. Welch. In an address on Friday at a ceremony where a number of Barbadian nationals were recipients of awards for the invaluable contributions they have made to the island, Barbados Prime Minister Hon. Freundel Stuart, who is also Chairman of the Prime Ministerial Sub-Committee on Reparations, urged the audience to keep the issue of reparatory justice at the forefront within the region. “We must sensitise our people to the ingredients of this debate and of course to the need to be part of this struggle to ensure that a lot of the damage that has been done as a result of our slave and colonial experience can be repaired not only by our own efforts, which of course we cannot forsake or ignore, but repaired by those who caused the damage in the first place,” said PM Stuart.